What is it about rational Adrian on Sundays, but emotionally insecure Adrian on weekdays? 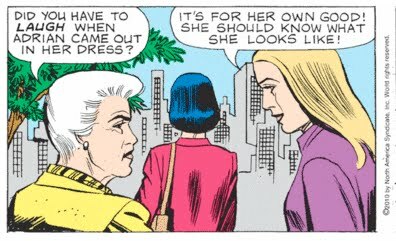 All week she's been doubting herself because of Jill's manipulative statements: Your dress is old fashioned. I don't want to be a joke walking down the aisle. You're marrying below yourself. He is only a cop, and I'm a doctor. 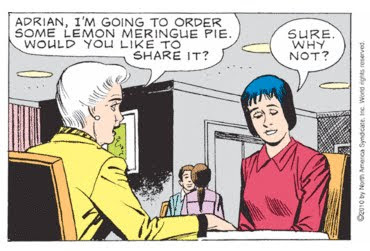 But last Sunday, Adrian was all Let's not worry about the dress, and now today: Lemon meringue pie is for losers. People can say what they want. I hope Scott works hard all week but gets Sundays off. That's probably the best chance for their marriage. 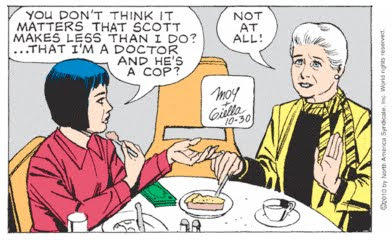 Mary Worth, you lying little sneak. You just told Jill Black that you didn't want dessert, but the moment she leaves, you order lemon meringue pie. Back stabber! 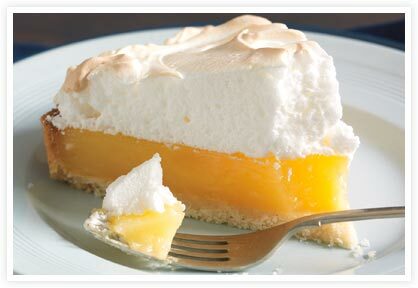 Still, you can't blame Mary; she looks like a lemon meringue pie. Her hair is the meringue. I know Mary is excited to have chin napkin back, and Adrian is depressed that her little tyrannosaurus arms keep her from using a glass properly, but if Jill gets away unscathed, this lunch is entirely for naught. Let us not forget, Scott saved her! She saved her from Ted Confey, who Adrian mistook for someone likable. Now it is Mary's turn to save Adrian from someone else Adrian has mistaken as someone likable. Poor Adrian. Three years ago, she was performing brain surgery on herself and accidentally removed the section of brain that assesses whether or not someone is likable or not. Fortunately, there are plenty of people around who can save her. Jill makes an excellent point. I mean, look at Mary. She's been rejecting Jeff's proposals for years. Of course, she's been married before, so she may not be as desperate as Adrian who has been trying to get married for as long as anyone can remember, and is perfectly willing to settle beneath her station. 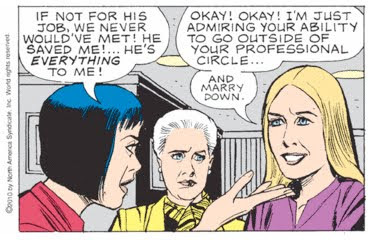 Is Adrian Corey suddenly the only level-headed woman in this trio, or did she just get distracted when she walked past the persuasively named Lunch Restaurant? A lady would wait to laugh until after Adrian had left the room. 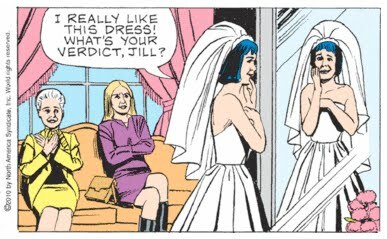 I can see Jill and Mary developing a wonderful friendship. A year from now, Mary will say, "You know, Jill, I did not like you when we first met. 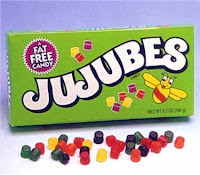 Do you remember that? And Adrian's silly dress? 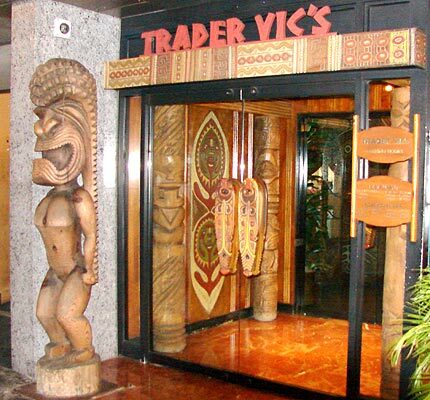 Wonderful memories." Adrian's gift for choosing friends never ceases to amaze. 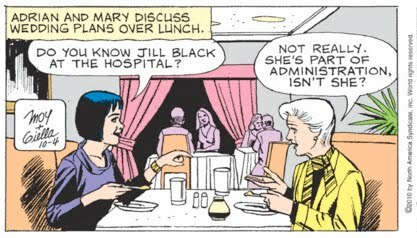 Jill Black, Ted Confey and Mary Worth... what a stable. 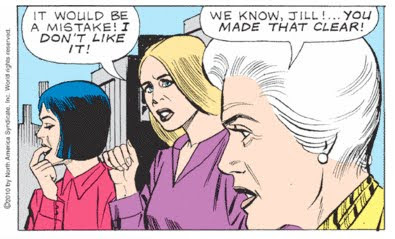 Speaking of stables, something about Jill's face today reminds me of when Pinocchio's friends turned into jackasses. It's especially hard to see yourself clearly in a funhouse mirror that inflates your head, dislocates your shoulder and spins your veil around backwards. Adrian: What do you ladies think? Mary: Oh, Adrian… it’s beautiful. Adrian: I really like this dress! What’s your verdict, Jill? It has the perfect combination of the features I love! Mary: It really suits you. Adrian: I never thought I could look this way before! Mary: It’s marvelous! You look lovely. Mary: It’s perfect Adrian! It’s simple yet flattering. Adrian: I like it too. I never felt this way before. What do you think Jill? Jill: Ha ha ha ha!… Ha ha ha ha!… Adrian, you look so SILLY! Adrian: Oh NO! … Silly’s not the look I’m going for! Jill: It’s so old-fashioned! You don’t want to look like you’re from another era, do you? Adrian: No… But I LIKE this dress! Does it really look unfashionable? Mary: I don’t think so at all! It’s beautiful and classic! And the important thing is YOU LIKE IT! Jill: Don’t kid yourself, Adrian! 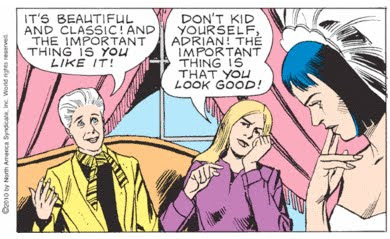 The important thing is that YOU LOOK GOOD! Adrian: I don’t want to walk down the aisle as A JOKE! Jill: It would be wrong if you did. This doesn’t look good. 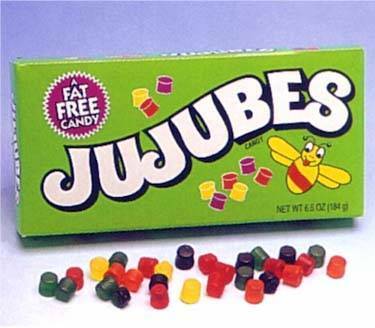 Perhaps growing up with Dr. Jeff and Dr. Drew, Adrian has learned that her opinion is as substantial as a Jujube. So the question is, whose fashion advice do you take? The woman dressed entirely in yellow, or the woman dressed entirely in purple? P.S., If you haven't checked out the new song on the Charterstone Jukebox in the right-hand column, I hope you like it. You know, I've been giving it some thought... Maybe Karen Moy isn't patterning Jill Black after me. I mean, there are a lot of differences. For one thing, I don't have long, flowing blond hair. I'm quite bald. Second, I really don't have much wedding planning experience. I've only planned one wedding, and I really didn't do that much, and didn't particularly enjoy the experience. And third, I never say "Ha Ha Ha Ha" when I laugh derisively at a friend in a wedding dress. I'm more of a "Hee Hee Hee" kind of guy. I can only assume, therefore, that Karen Moy really loves this blog. As apparently so do many of you! I had no intention of soliciting so much praise and adoration in yesterday's comments, but I have to admit, it felt really good. Unless all of you were just toying with me and secretly laughing behind my back. Like this: Ha Ha Ha Ha! Well, Jill's verdict is in. Today's strip really hurt me personally. I can't help but wonder if Moy is writing Jill's character as a reflection on me. My father always taught me that "The easiest thing in the world is to be a cynic." 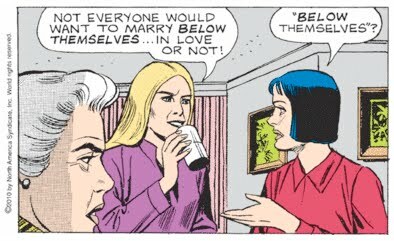 And, in Mary Worth's world, it is even easier. 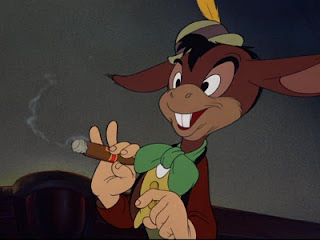 But I've really tried to avoid cynicism in my blog. I would never dream of criticizing Karen Moy and Joe Giella; only the characters that inhabit their world. 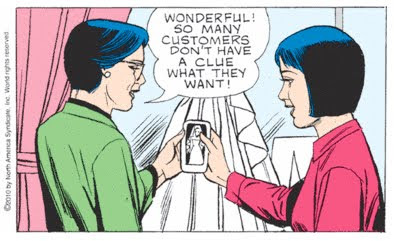 And can Moy and Giella help that everybody Mary Worth knows is shallow, irrational and a horrible dresser? Can they help that Santa Royale exists within a continuity tear in the fabric of time and space? No, they are forced to do the best they can with what they have. And I think they do a marvelous job. But clearly, Karen Moy thinks I'm mean spirited. And in Jill Black, she has painted me as a cynical, type-A moron, and I don't think I can live with that. Perhaps I've taken this all too far. Perhaps Karen Moy is right. 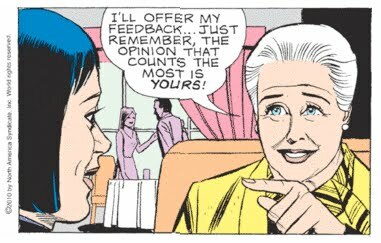 By reading Mary Worth loyally, every day, I've become what my father so desperately tried to prevent. A cynic. I'm sorry to have let you down, Dad, and I'm sorry, Karen Moy, for hurting your feelings. It wasn't my intention at all. This blog has gone on long enough. 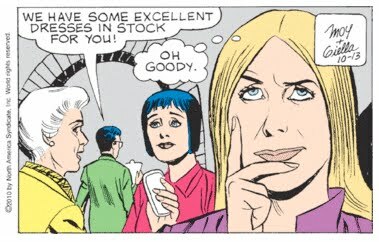 It's time for me to hang up my pen and retire from reading Mary Worth. I won't have to cancel my newspaper subscription, since my paper, like so many others, no longer carries this wonderful strip. It's been a great run, but I want my soul back. Yesterday, we had the biggest cliff-hanger in Mary Worth since Aldo Kelrast's "Oh no!" -- "Jill, what's your verdict?" Well, Jill, open your mouth and let your simmering contempt spew! All week, you've kept your disdain and sarcasm to yourself, which may be appropriate in certain circles, but it's time to save your friend from buying the first ridiculous dress she tries on with all those embarrassing features. I can't fully express how disappointed I am that Jill did not render her verdict today. That being said, dear reader, now I get to hear your thoughts on the perfect combination of the features Adrian loves. Your comments yesterday kept me smiling all day. 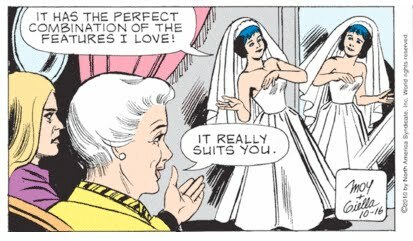 It's a good thing Jill Black is there to keep Adrian from making a huge mistake and looking like a giant albino Tiki pole on her wedding day. Like Jill, I find that as the administrator of a large nonprofit organization, harboring secret resentment for those who work and volunteer there is one of my greatest professional strengths. I like Jill Black! She rolls her eyes and is full of disdain for the Santa Royale Bridal Salon's inventory. Just like me. I'm assuming that's a photo of Adrian's mother on her wedding day. It's a good thing Adrian knows what she wants. And, fortunately, the dress is wrapped up in a box in the attic with the rest of her dead mother's stuff. 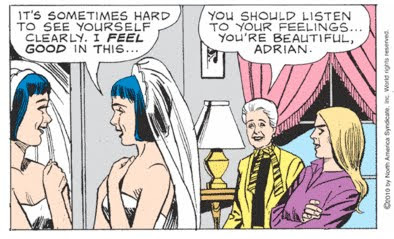 I think it would have been awesome if Adrian had just brought in her mother's wedding dress and said, "Do you have a dress like this?" Awesome and helpful. 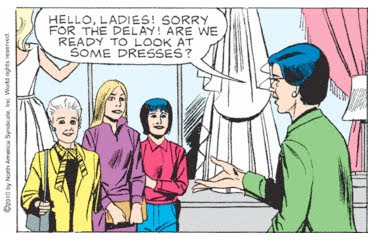 I think she means, "Are we ready to look at some GIGANTIC dresses?" Those are some pretty huge manikins back there. I've been paying more attention to the National League Divisional Playoffs this week, so I was surprised this morning when Jill arrived in street clothes. All week I thought it was Jill greeting them at the Santa Royale Bridal Solon already wearing the dress she had picked out for Adrian. 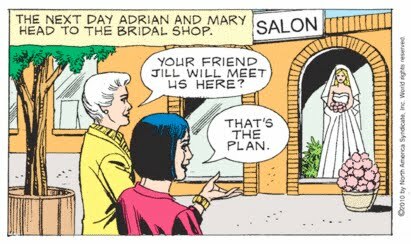 Adrian, I think Mary Worth is suggesting that your happiest days will be spent with your husband, not with Mary and Jill. Your husband, Scott. Remember him? 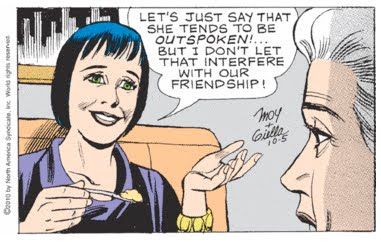 And thus the die is cast: Jill Black, outspoken Type A personality, has already had the validity of her input negated by Mary Worth's passive aggression. As long as Adrian chooses Mary's favorite dress, everything should work out just fine. Jill Black doesn't stand a chance. "She's very outspoken. For instance, she told me she hates my new eye color. Hmmmm... this mash is delicious. I must speak to Jill about serving it at the reception!" No, don't let Jill Black help! She'll ruin everything. Wedding's are supposed to be white, not black! And if anyone doubts that people's names don't foretell their character, I remind you of Dr. Brian Good. When Mary says, "Together we'll make it a great day for you," I'm quite certain the "we" she's referring to includes Adrian's dead mother! 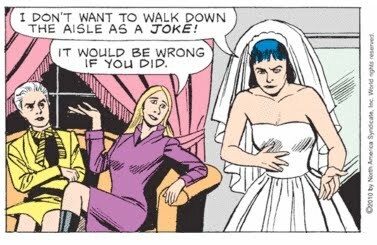 Somehow she intends to channel the late Mrs. Corey and give Adrian the wedding of her dreams. We've always suspected that Mary dabbles in the dark arts as she meddles in the lives of her unsuspecting victims, but this confirms it. It may also explain why Adrian appears to have gone goth. This is gonna get spooky. No, Adrian, we're the lucky ones because we get to share this with you! 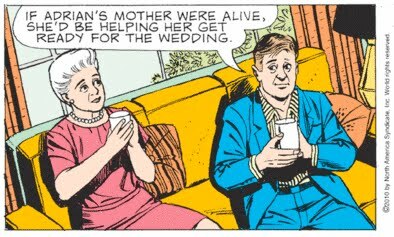 I can't think of anything I'd enjoy more than watching Adrian Corey and Mary Worth plan a wedding. If Adrian's mother were alive, she'd tell you to sit up straight, and stop being such a slouch. By the way, dear readers, if you expect to get an invitation from Mary to Adrian and Scott's wedding, you'd better register for Santa Royale citizenship by following this blog. Our population has plateaued at just under 100, so this is a special appeal if you haven't already become a citizen.